If you love FREE NHL trading cards and you live in Canada, you’re in store for a lot of fun tomorrow, Saturday, February 12. It marks the third annual National Hockey Card Day event where hobby shops and retailers throughout Canada work in collaboration with Upper Deck to provide their valued customers with free packs of NHL cards. Upper Deck plans on making the day even more special with a few surprises. First, the company randomly inserted some very rare autograph cards of Taylor Hall, Sidney Crosby and Bobby Orr into packs. The autograph cards are ONLY available in hobby packs. While those will be very difficult to pull, Upper Deck also is planning on giving away a variety of autographed items to both collectors and hobby shops throughout Canada tomorrow just for chronicling their events and experiences on Upper Deck’s National Hockey Card Day Facebook page. A treasure trove of Hockey collectibles are up for grabs to collectors who post images to UD's National Hockey Card Day Facebook page starting tomorrow! All Canadian hockey fans needs to do is grab their cameras and upload images of their visits to these hobby shops and retailers, showing off the cards. Upper Deck will award great items like boxes of NHL trading cards, autographed mini-sticks and pucks from the NHL Draft, 2011 UDA calendars, a pair of autographed Reebok gloves by Brett Connolly and two signed National Hockey Card Day blow-up cards of Jeff Skinner and Taylor Hall. 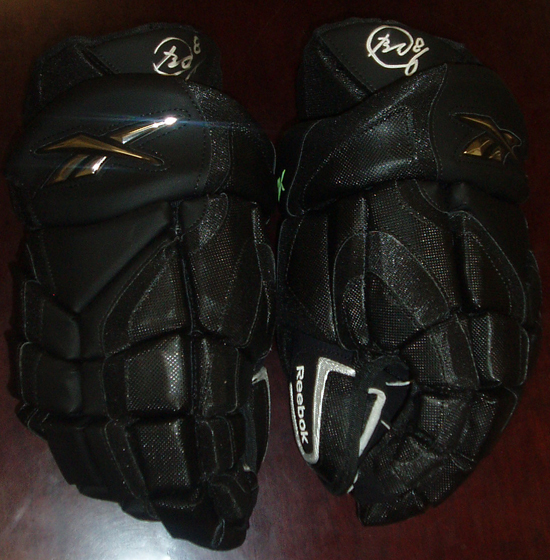 Just for sharing their experience, one lucky collector will take home this pair of signed gloves by Brett Connolly. 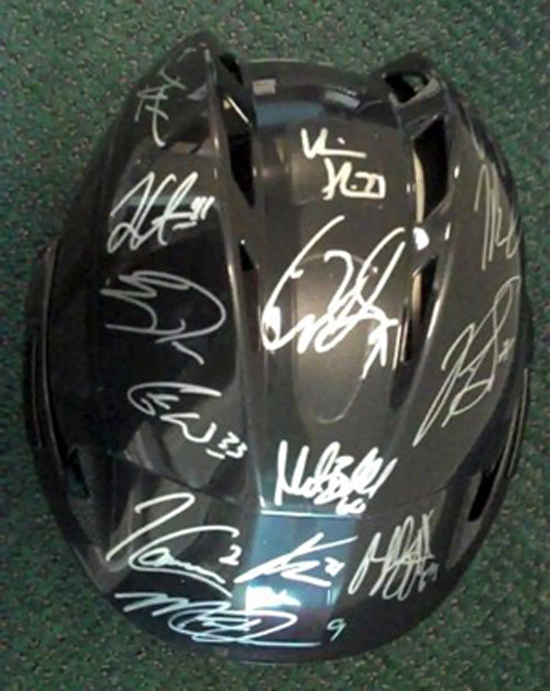 Two hobby shop owners who share images of events they are running are eligible to receive a 2010 NHL Rookie Showcase Helmet signed by 23 of the top rookies from that class including Taylor Hall, Tyler Seguin, Jordan Eberle, Jeff Skinner and many more! Hobby shop owners who share what they are doing on NHCD can win one of these great NHL Rookie Showcase signed helmets! I am going to look for my old 70’s cards. I haven’t checked them out in ages. Awesome news UD thanks and I shall take part in the contest tomorrow! Thank you for doing this guys!! Awesome Iam a big hockey fan I love upperdeck cards they are great!!!!!!!! What about us hockey lovers in the U.S.?? GO HAWKS!!!! I just got an email from Chris – I’m a lucky winner! Yay! Thank you Upper Deck!